To begin my first edition of Retro Comics, I decided to go back and look at the first comic book I ever read: X-Men Unlimited #3. 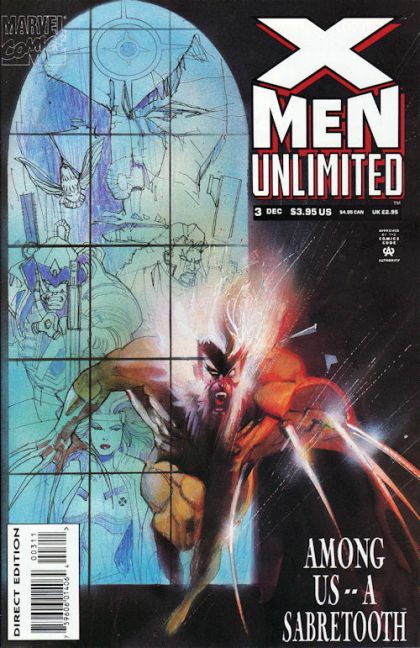 First published as a double-sized quarterly between 1993 and 2003, X-Men Unlimited served as a short story anthology series in the X-Men universe. The series focused on small, self-contained one-shots between major monthly storylines and events, and provided a vehicle for lesser known writers and artists to work with these well-known franchise characters without impacting the rest of Marvel’s continuity. Issue #3, titled The Whispers Scream, was written by X-Force and Deadpool co-creator Fabien Nicieza and penciled by Mike McKone. It was released December 1993 with cover art by Bill Sienkiewicz. This issue follows Maverick as he seeks the help of Wolverine in stopping Sabretooth. Following the death of his friend and partner Birdy at the hands of his son Graydon Creed, Sabretooth is on a vicious killing spree, murdering the members of an illicit trade operation that took place some years prior. When Wolverine proves too elusive to find, Maverick instead enlists the assistance of X-Men, to help him track Sabretooth to Japan for an encounter with the Silver Samurai. While this issue first presents itself as a straightforward chase story with Sabretooth as its antagonist, it quickly becomes an intriguing look into the mind of a murderer. Sabretooth, who had previously relied on the telepathic influence of Birdy to quell his violent urges, is now at a total loss. Overcome by insanity, he begins searching for another telepath to pacify his broken mind. This opens the door to several fascinating questions of morality as Charles Xavier takes it upon himself to venture into the hellish landscape of Sabretooth’s memories. There he finds the source of Sabretooth’s cruelty: A childhood spent under the fist of his abusive father indoctrinated the young Victor Creed in an endless cycle of violence and pain. With Birdy’s help he was able to bury his guilt behind the trauma, and excuse his own savagery as a product of his father’s abuse. Determined to rehabilitate Sabretooth, Xavier agrees to house him at the school, entering into a tenuous pact to put an end to his violence and make him pay for his crimes. Overall this is a solid and captivating story with some serious emotional punch. 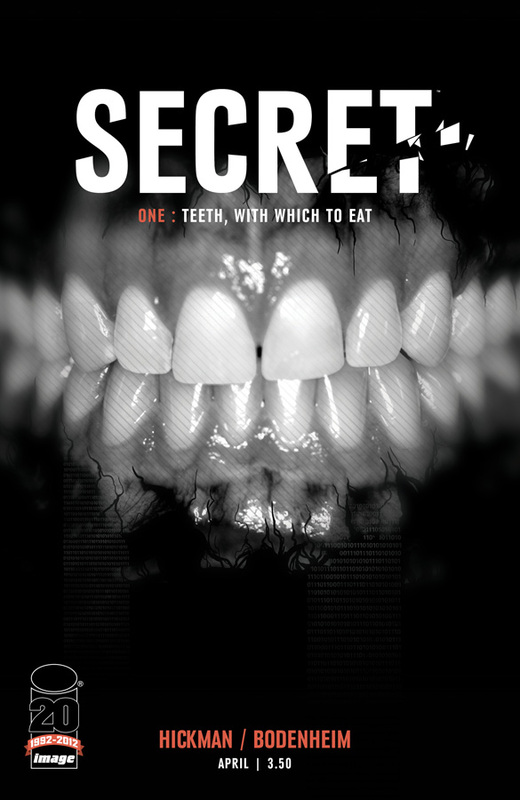 A lot of the strength lies in the writing, with some deft handling of the morally compromising situations presented here. At no point does Nicieza attempt to rationalize or excuse Sabretooth’s violence, and that works to his advantage. 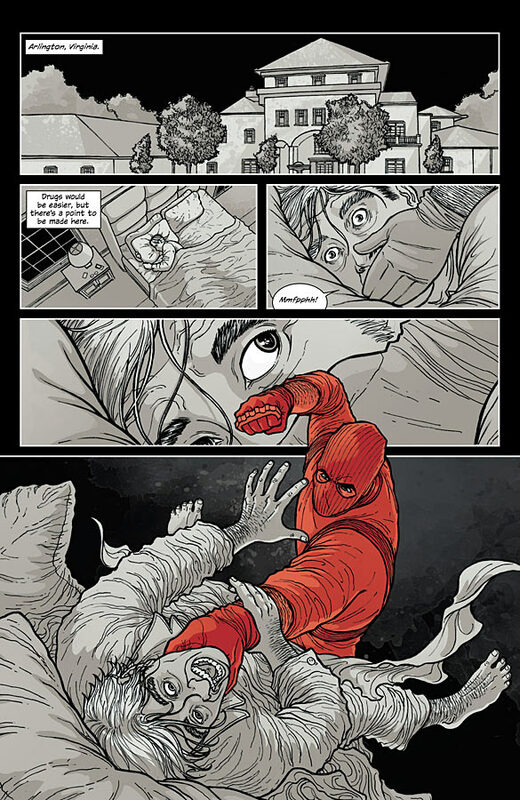 He appropriately paints the young Victor Creed as a victim of violence, who turned his cruelty outward rather than attempting to overcome his demons. Yes, Sabretooth is a product of brutality, but he chose to pursue this life, making him culpable for his actions. He is a wounded animal, but also an intelligent one as Xavier finds, and something about him is worth trying to redeem. This moral question of putting Sabretooth down like an animal or choosing to rehabilitate him is certainly interesting in the context of a superhero book, given the weight of his crimes and the full breadth of his violence. No matter the strength of the script, however, it’s the artwork that really carries this book. McKone’s offers some strong art here, with several really engaging panels and dynamic page layouts peppered throughout. There’s a peculiar static quality to his lines that makes the book feel somehow quiet to me, perhaps even a little eerie. It reads like Xavier’s clinical detachment as he moves through Sabretooth’s memories, looking for answers, and perhaps it’s meant to. To put the reader in Xavier’s frame of mind as an unintended viewer looking in on Sabretooth’s madness. Whatever the reason, there’s just something about the ferociousness of McKone’s flat-nosed, dog-like Sabretooth that really sticks with me. It’s sinister and beastly without coming across as cheesy or overplayed, and helps to ground Sabretooth as a villain, albeit a much more complex one than we expected. This issue is emblematic of 1990s comic books in a lot of ways. From the elaborate and often clunky costumes designs to the sometimes long-winded dialogue, complete with the almost perplexing accents from Rogue and Gambit, this book is quite the product of its time. Even for that, the story is striking with some truly memorable scenes. A nice balance of philosophical questioning and action-adventure storytelling, this is a favorite issue of mine with real staying power, even after twenty years. After the somewhat controversial end of this title’s inaugural arc, many readers were disappointed to see Annabelle Riggs die so soon. 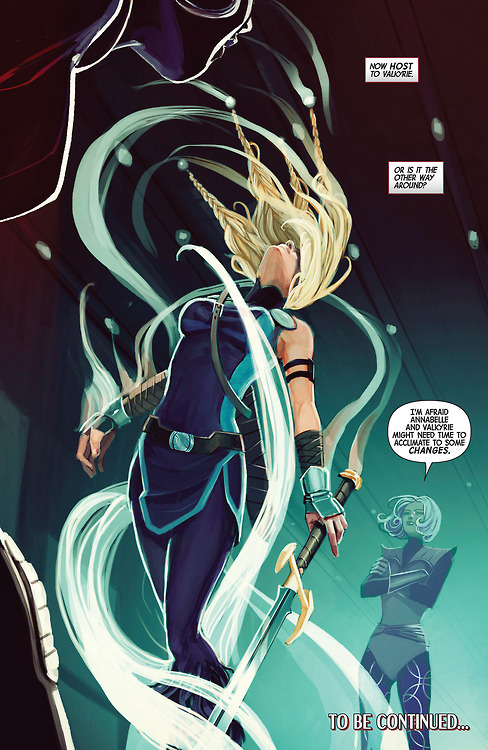 The character’s surprising death abruptly ended her role as a powerless but capable (and certainly fearless) Defender, as the team’s resident expert on Asgardian artifacts. Her sacrifice to stop Valkyrie’s killing spree (as Val’s alternate persona, the Doom Maiden Rage) caused serious rifts in this relatively new team, as Misty Knight lashed out at Valkyrie and their fellow Shield Maidens abandoned her as their leader. However, with the recent release of the much-anticipated #7, this title has lived up to its promise to begin an all-new arc, with some surprising plans for its principal characters. Stephanie Hans takes up the artistic reins in this issue, stepping in for regular artist Will Sliney, as Annabelle deals with her new status as a member of the celebrated dead in Valhalla. Her particular station is at an old inn and tavern, filled with many great and boisterous warriors, all of whom Annabelle feels little kinship with. She doesn’t belong here but she’s resigned to her fate, content to have sacrificed herself to help Val return to her senses. Meanwhile, Val mounts a rescue effort and travels to Valhalla to resurrect Annabelle, making amends for stranding her there undeservedly. Her quest reunites her with Clea, the exiled sorceress Val helped hide from otherworldly threats, whose skills Val requires for this spell. Although Clea is pleased to see Val, she hesitant to use her magic to revive Annabelle, warning that the ritual comes at a great cost. Determined, Val convinces Clea and brings her to see Annabelle at the inn. There Val and Annabelle try to reconcile their thorny recent past, and Clea brings Annabelle back, but at a price: Val must sacrifice her life to restore Annabelle’s, and Annabelle is her new host. Their spirits tangled in the same body, Annabelle is the vehicle through which Val must navigate the mortal realm, switching back and forth between forms whenever the need arises for Val’s brute warrior strength. Changing things up for the team, this decision helps to mend the rift between Val and Misty, and allows Annabelle to fulfill her new role as Val’s earthly vessel. Val sacrificing herself for Annabelle, and Annabelle’s upgraded status as Val’s host, adds another layer of humor and interest to the team dynamics. 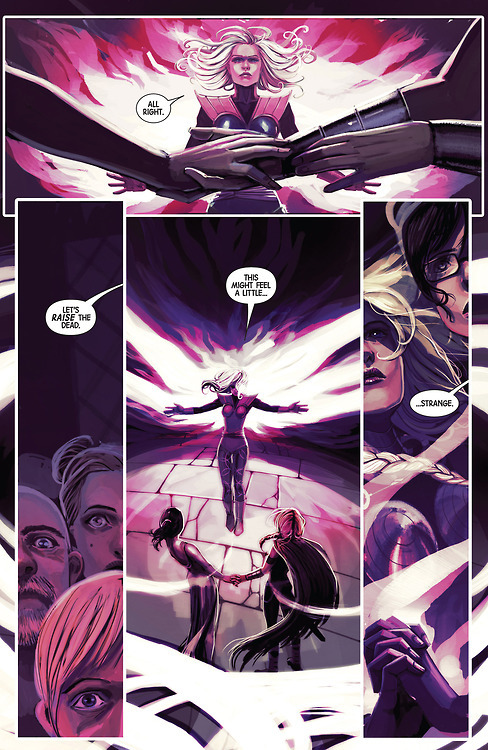 While things seemed to be smoothed over between them, and Misty is likely on her way to forgiving Val for killing Annabelle in the first place, this opens the doors to new intrigue as the Defenders gear up to tackle Le Fay’s new team of Doom Maidens. New status quo, indeed. A striking departure from Sliney’s regular pencils, Hans’ artwork steers this book in a gorgeous new direction in tone and presentation. Her vision of Valhalla is lush and fertile, with an ethereal quality that feels dreamy and fantastic but appropriately so, offset by the ugliness of the trolls Val and Clea face. The principle characters are gorgeously rendered with the help of strong panel compositions and soft, otherworldly color palettes. Her females are strong but still feminine, sacrificing little of their quirks or flaws to embody the strength and power that warriors like Val represent. 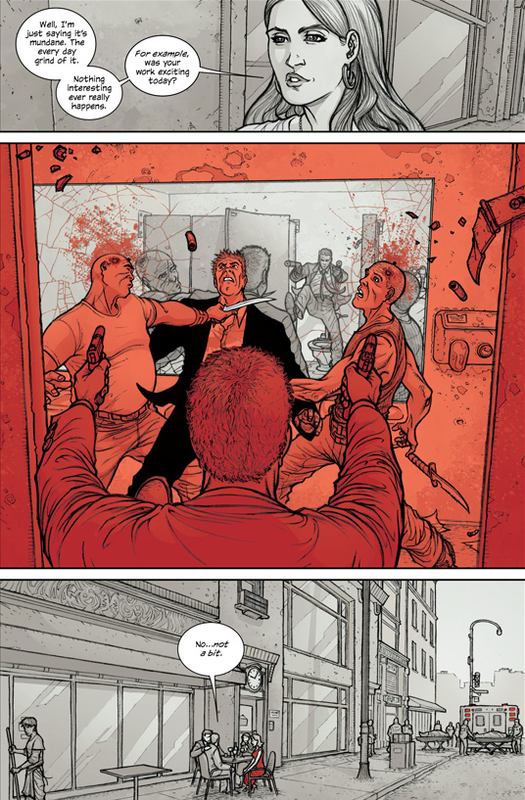 Gone is the serviceable but at times bland artwork we’ve seen from Sliney, upgraded to Hans’ decisive action sequences and evocative interior spaces, which keep the story balanced and well-paced. Overall, Hans strikes a good equilibrium of emotional weight and action-adventure, making for a highly engaging visual reading experience. As for the writing, Bunn’s script this issue is straightforward but intriguing. The surprising reveal of Val’s updated backstory could have cheapened the character, but it continues to work here, especially in the face of recent developments. Although it was somewhat surprising to see Annabelle come back so quickly, after the pomp and circumstance surrounding her death, the decision for Val to immediately look for Annabelle is true to her character. Val’s resolve to make amends speaks to her need for redemption; not just for Annabelle’s death, but for the sense of loss and ineffectiveness she’s felt since the beginning of the series. 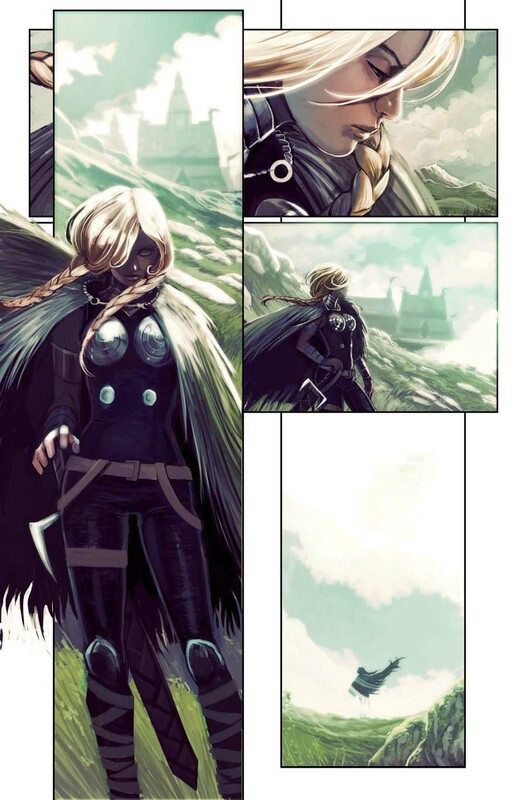 She’s looking to restore her own honor by living up to Odin’s expectations, which she has previously failed to do. All of this feels very natural for her characterization, and further humanizes her, despite the many twists and turns she’s taken as of late. Bunn also does something very interesting with Val and Annabelle’s relationship in this issue. While far more complicated than before, their dynamic remains refreshingly downplayed, and very much based on the mutual respect of comrades. Just what comes of their uncertain friendship, however, remains to be seen. Annabelle’s romantic interest in Val, as seen since the first issue, has not yet been fully addressed, and is likely to be further confused by recent events. It does say a lot about Val’s feelings for Annabelle in that she was so willing to sacrifice herself for her, which does open the door to some exploration on Val’s side of the relationship. As Val’s new host Annabelle has a lot to ponder, but her feelings for Val have been given the opportunity to further develop her character. All of this will be interesting to see in the future. Overall this is a successful issue with some solid writing and stunning artwork. Big on promises, it lives up to nearly all of them, offering an intriguing new opportunity for this team to grow. Where this title goes from here is uncertain, but the foundations put in place make for some interesting possibilities. While the Marvel Universe is embroiled in its share of sweeping drama this year, from the reality-crushing consequences of the Infinity event to the mutant brawling going on in Battle of the Atom, something quite sad happened. In the fray of big budget movies and multi-title tie-ins, a little book slipped under the radar and ended a beautiful run after only ten issues. 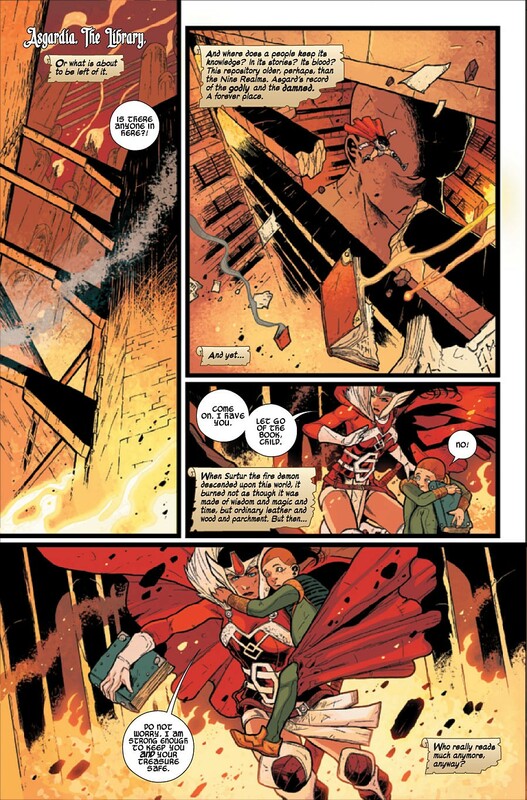 The fourth and final incarnation of Journey into Mystery, helmed by writer Kathryn Immonen and artist Valerio Schiti, recently wrapped up its last issue at #655, sailing off into that good night with little pomp and circumstance. Despite rave reviews and consistently excellent content, this little book that could just couldn’t live up to the hype of other, better selling titles. Although this book is gone, the adventures of Lady Sif, as well as the amazing efforts of Immonen and Schiti in bringing her to life, won’t soon be forgotten. The original Journey into Mystery began its life as a horror-fantasy title leftover from Marvel’s predecessor Atlas Comics, carrying into two volumes that ran intermittently between the 1950s and 1970s. Focusing principally on the adventures of Thor, this title covered much of the mystical fantasy elements of the Marvel Universe, and over time served as an introduction for many other characters in the same vein. Taken over by Kieron Gillen and Doug Braithwaite after the events of the Siege series, the focus shifted to Loki from issues #622 to #645 for a run that was praised by both critics and fans. 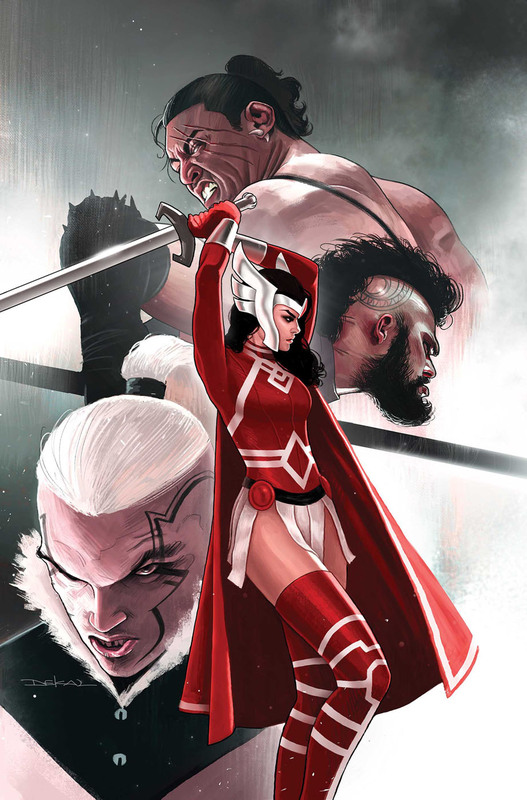 With issue #646, the title was relaunched to coincide with its rebranding under the Marvel NOW imprint, and Immonen stepped in to bring Lady Sif into the spotlight. 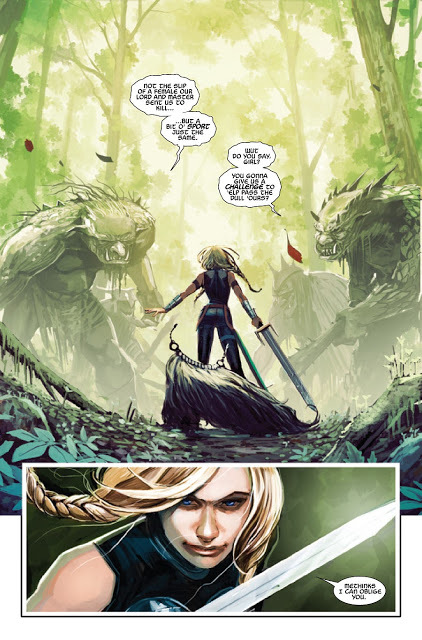 For ten issues, Sif led a dynamic cast of Marvel’s most well-known Asgardians into a world of magic, mystery, humor and action, expertly developed by Schiti’s skillful pencil work. Sif, while a major supporting character in Thor’s title, is not quite so well-known beyond the pages of his companion’s book. This made it somewhat difficult to stir a strong sales base, as many mainstream readers just weren’t as familiar with Sif as they were other, better known Asgardians. Despite its short run, Journey into Mystery covered a lot of ground. From the depths of ancient ruins to New York City, deep space to children’s fairytales, this adventure title followed Sif’s character development with poignant resonance. While taking a few cues from Gillen’s run, Immonen made this series her own, putting a unique spin on the character and the tone of the book. 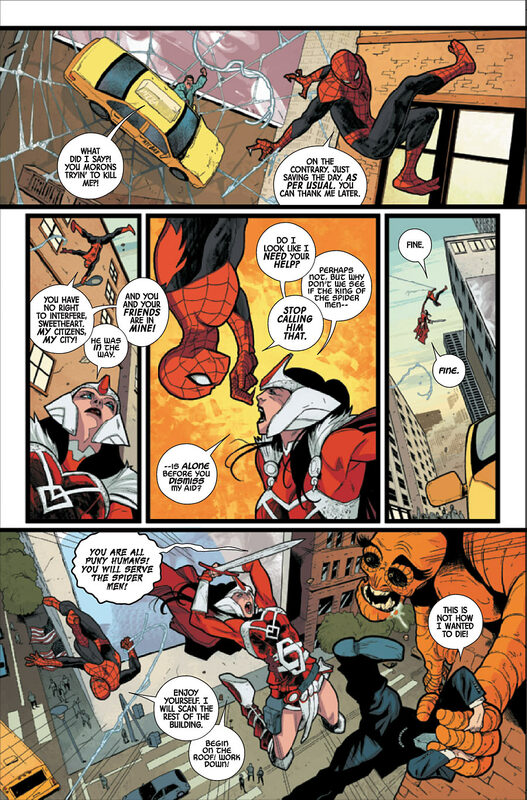 Every adventure was well-framed by Immonen’s strong scripting and razor-sharp dialogue, offering equal measure of heartfelt introspection and witty banter to keep things fresh and fun. Even in keeping with the expectations set by her predecessors, this title was always uniquely Sif’s. When we first encountered Sif, she was conflicted about her role as a warrior in what she saw as a culture in decline, as Asgardia turned its back on its once-proud past. We saw this reflection throughout the series, a question of purpose in uncertain times. With regular guest appearances from many big-name hitters in the Marvel stable, Sif was always busy and had a great cast to play off of, with much success. Through her perilous journeys, first as a wayward berserker then later as the warrior we know and love, we watched Sif grow and change, forging new relationships and strengthening old ones. Over the course of the title she came to terms with her place in a changing world, and accepted Asgardia’s new role in that world as well. Her journey wasn’t easy, and it certainly didn’t always paint her in a favorable light, but she was always fascinating, relatable, and engaging to read about. The book’s biggest strength was its visual consistency, guided by Schiti’s amazing pencils and the stellar color work of Jordie Bellaire. Issue after issue, this title was a gem with its inventive page designs and panel compositions, serving as an evocative complement to Immonen’s scripting. Bursting with energy and emotion, Schiti carried every plot through to the end with dynamic action scenes and engaging character interactions, his pages rounded out by Bellaire’s distinctive color palettes and clever background development. This visual cohesion helped to make the book so enjoyable: not only did every component of this title work well, but they worked even better together. While this book certainly wasn’t flawless, and did have a few fumbles as it sought its footing in the opening issues, it was a highly enjoyable addition to the Marvel pantheon. Immonen and Schiti told poignant stories, full of adventure and heart, intrigue and humor. 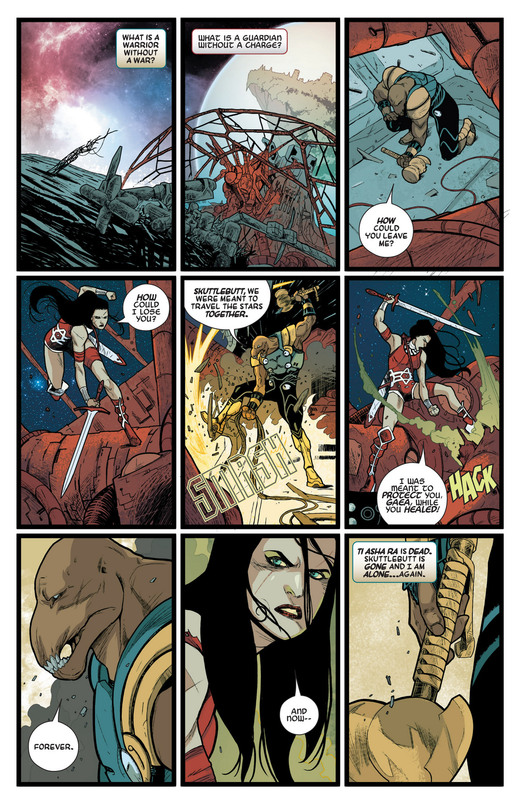 Sif was a strong protagonist with a fun supporting cast and engrossing exploits, offering a consistently satisfying reading experience month after month. So while Sif may be shelved for now, she will not soon be forgotten by her readers and fans, who got to enjoy this little gem of a book for as long as it lasted.